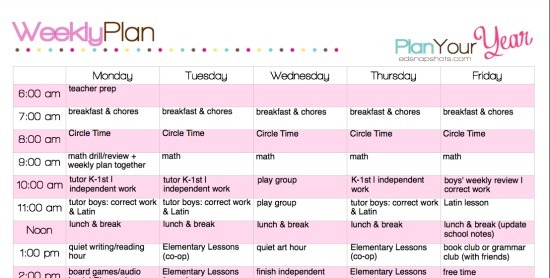 It’s the homeschool planning time of year! 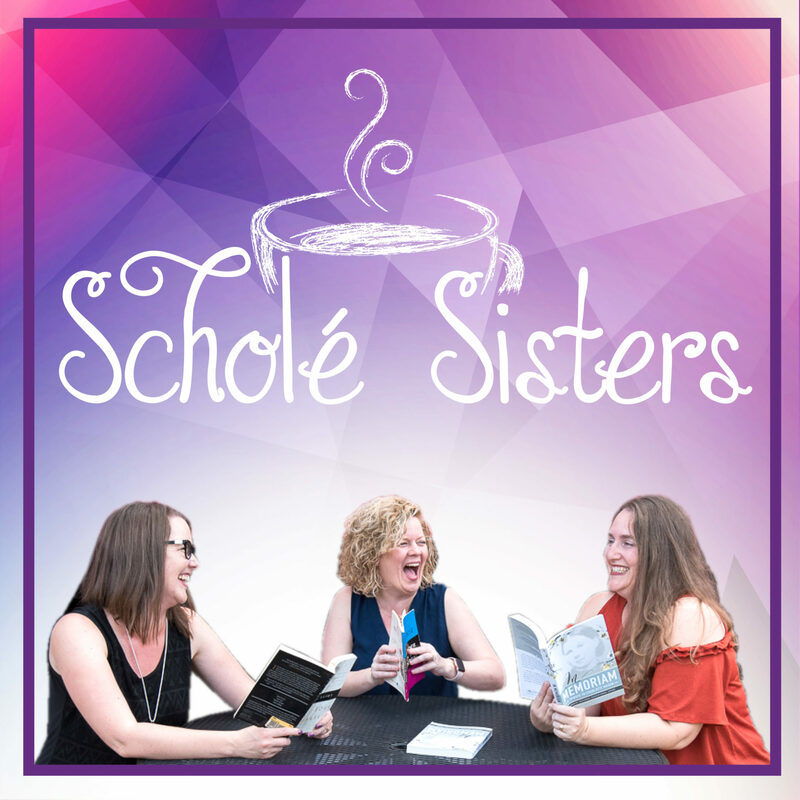 Before I share the details of the plan for our homeschool year, I thought I’d share how I go about determining the outlines of our time and how that affects my planning. Looking at the calendar is one of the first steps I take before looking at curriculum and materials. Honestly, this is quite late for me to be planning and writing about my planning, but because I’ve been helping with my brother’s wedding this summer, I have less mental space and time to spend at it. Still, it’s coming together nicely and I’m excited to write about it! 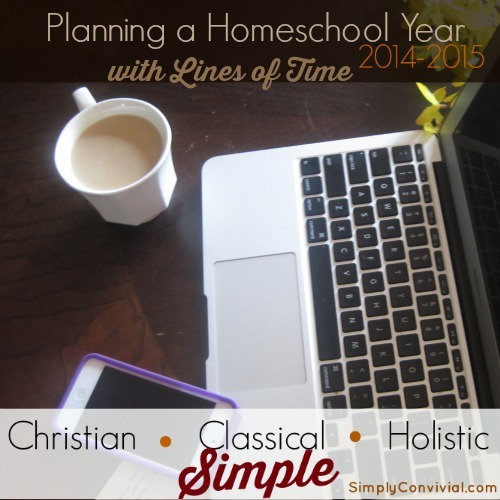 Planning for a new year really is the best time of a homeschool year. Ha! It’s tempting when beginning to begin with all our hopes, all our ideals, all our grand philosophy. But, really, the place we need to begin with the real people right in front of us. It’s also tempting to think we can fit more into our days than is actually possible. Especially when there are little ones underfoot, it’s best to budget twice as much time than you think. There’s always something with a toddler: toothpaste-painting, water-spilling, toilet-splashing, closet-emptying, fit-throwing. And if it isn’t them, it’s the others: dawdling, doodling, arguing, whining, pestering, bickering. With multiple children, odds are good someone is doing something that interferes with your plan fairly constantly. So we need to plan not as if it only depended on our own execution, but acknowledge in the accounting that these are little people, not little machines, we are working with. The fact that we are working with little people, who have their own ideas and affections and opinions, makes it tempting to abandon the notion of a schedule at all. Though we might try, however, we can’t escape the fact that we are bound in time and that everything happens in time. We can’t ignore the time factor, though we do need to find ways to not be stressed out by it. 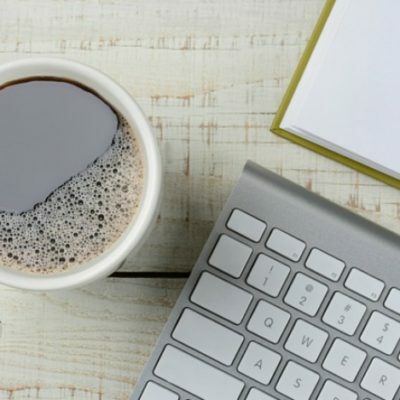 When I simply make a list of the things we have to do, ignoring time constraints, I inevitably end up with an impossible list, one that will not fit the time available. Time is a limiting factor, and one we should embrace, not fight. It forces us to simplify, to distill, to determine and act on our priorities rather than all our hopes and dreams. It is a blessing, not a curse, for our plans to be limited by time. We must remember our finiteness, planning for margin and rest. After all, rest is essential to learning. It requires just as much effort to set aside time for rest as to set aside time for a phonics lesson. So, while I am setting our course for the year, I also determine what our time will look like for the year. Figuring out the daily goals begins with figuring out the big picture, and it is the same when figuring out our time. Our time provides boundaries, limits, and direction, so I think of them as lines. The time-determined lines of our lives are boxes, envelopes, within which we must budget our work. So, when I am determining how much time we have to work with, I begin with the year. We school – that is, learn and grow and improve – year-round, but work on our academic goals from July-May. 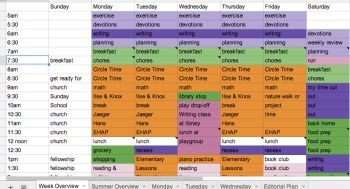 I plan for 6 6-week terms, with a break week between each term. We do take a longer, “summer” break off from mid-May through mid-July, but just this year I’ve come to see this as a term of its own, a “break term” if you will. We do swimming lessons, try for art lessons, do more nature study, spend more time outside, spend longer hours reading or playing legos (or, for me, writing and gardening). This time is just as packed with learning as the regular school days, and just as necessary for healthy growth. So though we school year-round, that doesn’t mean we take less vacation time or pack our year full of academic checkboxes. It is actually the opposite. I use this rhythm of our year to intentionally build in more leisure. You can click on the image here to download my 2014-2015 school calendar. I am trying to accept the imperfectness of how it worked out this year. Our Summer term is short and will be more informal and abbreviated than it’s ever been because my oldest will be going on a scout-like “camporee” and be gone for two of the weeks (he won’t be gone for two weeks, but the time he will be gone spans two weeks) we would have started school. Then there’s also a five-week term in there, and based on how things worked out this year, I’m also using the sixth week of our final term (instead of the seventh would-be break week) for our end-of-year required testing. When making this calendar, I usually start by working backwards from Thanksgiving week (which we take off), then for the second half mark off an Easter break before or after Easter and fit in the remaining terms around that, always ensuring we end in May (it’s a huge boost to morale to be done when the weather is perfect – not too hot, not too cold – while everyone else is hobbling to the finish line. 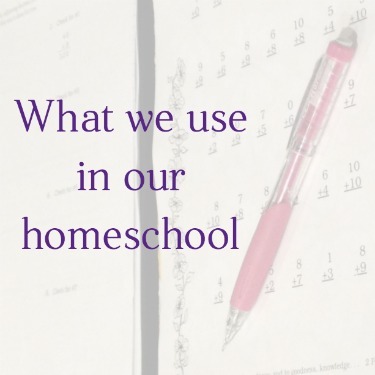 Schooling with manageable-sized terms has been a huge help in my own homeschooling endeavor. Six weeks is long enough to get traction and momentum and feel like we can push through, but short enough that a break is within sight when we start dragging. I don’t let the break time free-float or happen on the fly, but do stick to this calendar outline unless something dramatic throws us off. And, if we miss a day or two in the middle of a term, it in no way affects the break week. We don’t do school on break weeks, period. Personally, I think those break weeks are as important to the children’s development and blossoming as they are to my own sanity. The regular time off provides a light-at-the-end-of-the-tunnel at all points, is something they can (and do) talk about and make plans for, and is a time where they can pursue their interests and projects more wholeheartedly. Not only that, but I do believe that the downtime helps the information settle and percolate. They need that slower-paced week regularly to let their learning brew within them. And I need that week to catch up around the house, do projects I had to postpone, run extra errands, and clean up and reset for the next term. This year I’ve taken my term planning and applied it to all my planning and not just school stuff. So far, it’s been quite fruitful. For personal-life planning, I call them intervals instead of terms, both because it is a period of time and also because it reminds me of interval training, which is working intensely for a short burst and then resting. It reminds me to work in that sort of rhythm for improved growth and effectiveness. I have found that the weekly calendar is really more important to iron out than the daily. If I can work in margin and rotating time to deal with the various balls I have to juggle, then I can handle the days on the fly if I have to. But if I have no certain idea about the flow of the week, I end up during the day getting things done but still dropping more balls than necessary (sometimes it is necessary to drop balls; it can be ok). So, I’ve started daily reviewing what I call my “weekly time budget.” You might call it a schedule. The planning sheet in Pam’s planning pack I used for my first “rough draft” is laid out by the hour and called “Weekly Plan.” Then I move it to a spreadsheet with every row being half an hour, and I color code things: orange is school, green is house & errands, purple is “Mommy tank-filling,” etc. With the boxes colored I can see at a glance how much proportionally is given to each area and how evenly it is distributed through the week. Plus, color is fun. In my weekly budget, I first reserve the regular appointments, or time commitments with other people, whether they be classes or play days or church functions. Next I mark where our meal times generally fall. Then I block off the “school hours” I can commit to. I don’t stop, there, though. I am much more than a school administrator. I am a life administrator. I have to facilitate and manage all the aspects of our home life, including meals and housecleaning and errands. It all has to fit into our week. 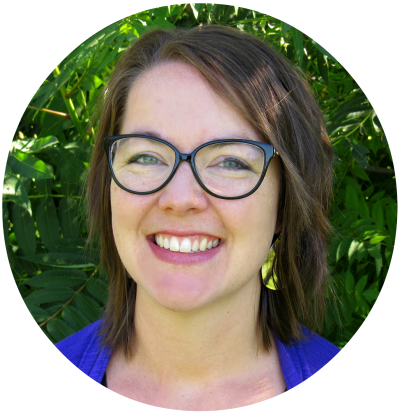 When we plan and fill all our time without reference to the mundane daily duties, we end up feeling frazzled and frenetic and frustrated. So I also allot time to laundry, meal prep, and errands. 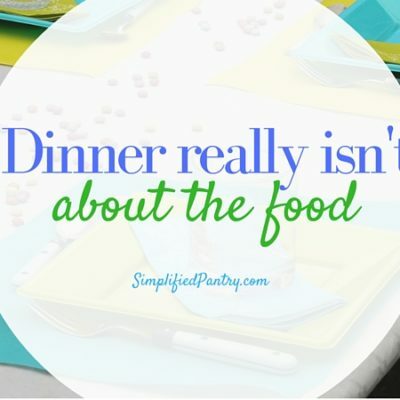 Other pieces in our week include “date” time with my husband: not actual outings with babysitting, but simply time we both reserve to spend together (and maybe let the kids play computer or watch a movie so we can play a game or sip wine and talk). That wasn’t a piece in our week last year, and I’ve added it in with this year’s plan. Before, with fewer kids and fewer responsibilities, it would happen organically. With last year’s routines and rhythms, it stopped happening naturally and it took us several months to notice. 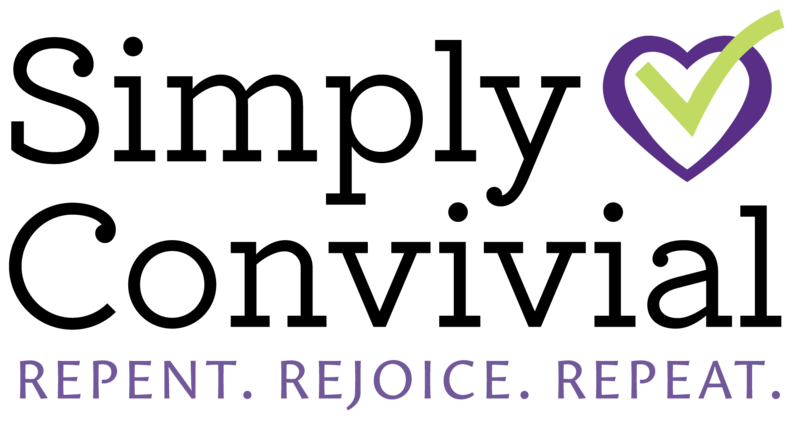 I’m not a fan of the big weekly “date night” push that seemed to be popular in evangelical circles a couple years ago, but I am a fan of intentionally deciding how to spend our time while taking into account our present reality. So now there is time blocked off for my husband and I to spend time together without technology and with kids occupied somewhere else. I also have time colored in for planning, for recording, for reorienting myself during the day, because it turns out that it actually takes time – and if I think I will fit it in around the margins, chances are it won’t happen most days because it’s not yet habit. We all have reading time, I have writing time, I have exercise and devotional time blocked off. It is a full week, and there are very, very few empty half-hour chunks (excepting Sundays). No, I’m not crazy, really. So, yes, the weekly time budget is all filled in and the week is full. But margin is also blocked in (like half-an-hour before any time we have to leave the house, or half-an-hour before dinner). Time is given for rejuvenation. A reasonable bedtime (well, an early one, since there’s also an early rising time) is plugged in. Also, Sunday is as much a day of rest as I can manage: we go to church, we fellowship with friends or family, we eat good food and drink wine and play a game, and I try to keep my technology off and my lists shoved away. Time-table; Definite Work in a Given Time.––I shall have opportunities to enter into some of these points later; meantime, let us look in at a home schoolroom managed on sound principles. In the first place, there is a time-table, written out fairly, so that the child knows what he has to do and how long each lesson is to last. This idea of definite work to be finished in a given time is valuable to the child, not only as training him in habits of order, but in diligence; he learns that one time is not ‘as good as another’; that there is no right time left for what is not done in its own time. Giving each duty its own time and respecting that is at the heart of discipline. So although I do apply this to my raising of my children (by letting them know the lines of the week and day), but I am trying to first apply it to myself. I believe learning that “there is no right time left for what is not done in its own time,” though exceptions abound, is still a “sound principle” to have as a foundation. With a foundation like that, the exceptions can blow you around but not knock you over. Again, to many of us life was overfull. We would not be hurried; we liked to say ‘I will do it in my own time.’ But at Scale How [the teacher college] time was to be respected, given to the thing or person claiming it rightfully. Then there would always be time, without over-pressure or distraction. This sense of time value was hard to achieve but it bore the test of experience during the two years’ training. What an effort of faith it all was to one so slow to read, to write and to think. It did not seem possible to find a moment for everything, yet if no time was wasted there was plenty of it and no hurry. My weekly time budget is a way of determining the “thing or person claiming [my time] rightfully.” Thought out like this is not for the purpose of being rigidly bound to the clock, but rather to show that there is time for all my priorities, but not much more beyond that at this point in my life. “If no time was wasted there was plenty of it and no hurry” is a quote I’m contemplating. This time budget is a way of attempting to work out that thought. After setting the weekly time budget, I find that the day’s “hard lines” are obvious and work themselves out naturally. Turns out setting my daily lines is actually what I was doing while making that time budget. So working out the daily lines isn’t more scheduling, but rather seeing that this day actually matters. You see, when I wake up and make a to-do list for a fresh Monday morning, I’m likely to think I can do anything I want to with this day. It feels wide open and full of potential. My weekly budget, however, tells a different story. I see that this day is part of something larger, and if I want that larger idea that I say I’m after, then I am going to have to spend my time in a certain way. Just like in a financial budget, you might find that you have a fixed allotment for “groceries,” yet how that gets spent depends on circumstances and serendipity: in-store sales, surprise leftovers, free fruit gifted you by a friend, etc. It’s the same with your weekly budget when it comes to the day itself. There is an allotment for “math,” an allotment for “quiet reading hour,” an allotment for “tutoring,” and an allotment for “housecleaning.” Each thing that happens during that allotment, however, is not micro-managed. What actually happens in those time slots varies depending on the day, because real needs and real opportunities show up in the moment. The trick of budgeting – whether time or money – is managing your needs and opportunities with your resources. The time budget lets you know what your resources are and doesn’t let you get away with thinking you can do everything you might have on your list. Once you’ve outlined the time available to you, you can make better choices about the best way to spend it. I noticed this comment in your post: And, if we miss a day or two in the middle of a term, it in no way affects the break week. We don’t do school on break weeks, period. I was wondering when you do the work set for the days that are missed during a term. My break weeks always seem to get messed up due to missed days during terms. I would LOVE to have my break weeks yet so many things get in the way. I know it probably sounds like I’m just not faithful with our term work but in the last 3 months we’ve had two emergency surgeries for broken bones (with many Dr appts an hour away – no ortho near us), two stomach viruses, an ER visit for stitches (couldn’t glue this one), and an emergency dental visit for another child (we have 8 total). It really stinks to take all our breaks for emergencies and sickness but how else does the work get done? Hi Rebecca! Yes, God often sends us life that doesn’t fit in our plans. I think part of my philosophy about this springs from my own kinda-unschooly homeschooled background. Plus, in our state we do not have to keep track of attendance or curriculum covered. So, when life happens and the plan doesn’t happen, then working through the life-happening is our plan and “counts.” I might put on an audio book in the car. I’d try to make sure there was at least a 5 minute math fact drill. And that would “count.” They’d also be learning how to handle interruptions, how to conduct oneself in public and in emergencies, how to talk to strangers – living life well is the lesson. That doesn’t mean math and all the other stuff doesn’t matter, but it means we have to live the life in front of us, and if it’s crisis mode, then handling that without stressing is the most important thing. And after a crisis mode, you probably all need a break! It’s ok to take restorative time! Your lesson time will be more productive when it happens if you aren’t stressed and if you’re not at the end of your rope. I think our feelings that we have to have a certain number of fully-checked-off school days comes from the public school model, which 1) is not good education and 2) isn’t even happening there. My mother-in-law is a substitute teacher for our local secondary schools. There are substitute days for all classes throughout the year, and pretty much nothing moves forward on those days. The sub’s job is mainly to keep order and babysit, she doesn’t really teach the class. Yet that day still “counts” on their attendance chart. So even if we are using the public school paradigm, an audio book in the car is no different (and actually way better!) than a substitute showing a documentary or overseeing busy-work meant simply to keep students in their seat for their period. Thanks for replying so quickly! I appreciate your time in answering. Yes, that does make sense and help. And, you’re right, part of my problem is getting stuck in the public school mentality although I have made progress on this : ). A planning related question about this though: In our state, we do need to keep track of days (180) so I planned for 144 book days and 36 other days. But I know that even those book days could be infringed upon (we’ve lived in A LOT of God-sent life chaos over the past 12 years). So how do you plan the number of books to get through if you can’t count on the number of days of actual book school? Does that make sense? Thank you, Jennifer! Your site is amazing; I love it! Mystie, this post reminds me that I need to thank you. 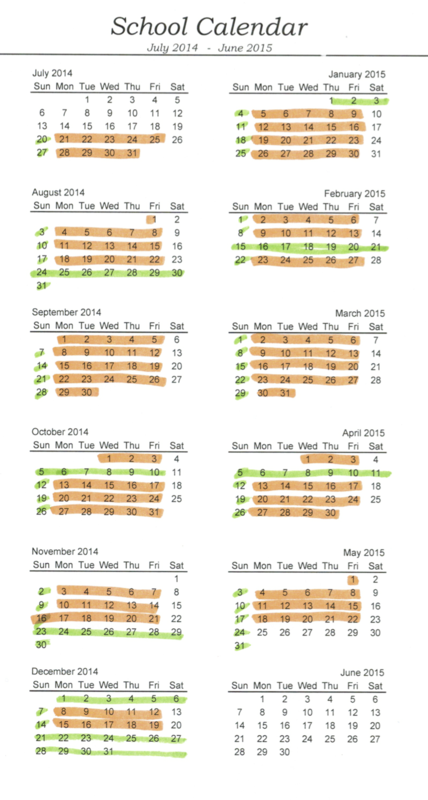 The idea of printing out a calendar and highlighting the weeks of school and the weeks off is just brilliant. I think it’s been at least three years since you taught me that, and I do it every year, and I’ve taught lots of new homeschool moms your trick over this period of time. You are such a blessing! Again, your posts are so great for me right now. 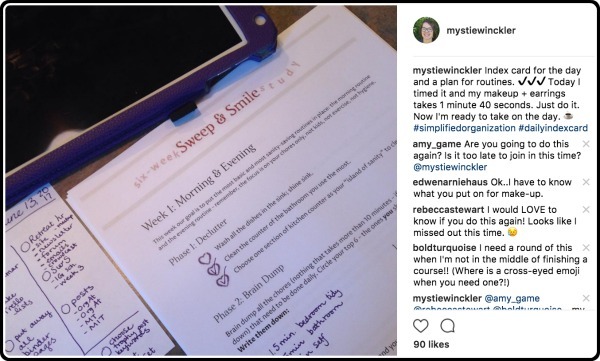 I’m loving that you do a 6 week rotation for school, and I find it very encouraging to read that it works for your family. I just decided at the end of 2013-2014 that for our next year, we’re doing a 6 week rotation schedule, with one week off after each 6 weeks on. Now to actually get my week off to do that planning… ;) Our vacation + sick baby + 3 birthdays in 5 weeks has not given me any time to plan out the coming year! Love this post! Thank you.